Powers/Abilities: Jacob Grimm doesn't possess any superhuman powers. He is an intelligent, caring and determined man who despite his age and partial paralysis continues to service the medical needs of a small rural community. The Thing I#1 (fb) ) - Jacob Grimm grew up on Yancy Street in New York. Unlike the other members of his family, he managed to escape the crushing poverty and the gang violence, putting himself through medical school to become a doctor. Jacob married his wife Alyce and the two lived in a posh uptown appartment. 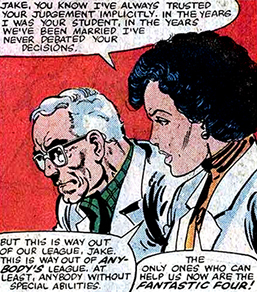 (Fantastic Four I#238 (fb) ) - Jacob worked in a New York hospital for twenty years. (Thing: Freakshow#1 (fb) - BTS) - Jacob and his wife took Ben Grimm for a visit to the local carnival as a child. (Infinity Crusade#2 (fb) - BTS) - Jacob's sister Sophie was diagnosed with a fatal form of cancer and succumbed to the disease. (Thing I#1 (fb) ) - When his brother Daniel and his wife Elsi died, Jacob became the legal guardian of their orphaned son, rebellious, street punk Ben Grimm. Despite Jacob and Alyce's best intentions, their nephew remained spiteful and agressive towards them for quite some time. However, after a few months of unrelentless love and care, Ben grew to realize his uncle wanted the best for him and started using the chances Jacob and Alyce offered him, like going to college. (Fantastic Four I#239 (fb) ) - Jacob survived a car accident that killed Alyce and left him partially paralyzed. The loss of both his wife and the use of his legs left him bitter and remorseful. During his revalidation period, Jacob met a young student nurse called Penny. They fell in love and despite their age difference and the objections of everyone except Ben Grimm, got married. The couple moved to the small town of Benson in Arizona, where they started a small medical practice. (Fantastic Four I#238 - BTS) - Famed archeologist Dame Ruth Efford came to Benson to excavate a historic site. The dig awoke a band of ancient, supernatural entities who befriended a local girl called Wendy, but attacked and killed several adults by literally frightening them to death. (Fantastic Four I#238) - Jacob and Penny were confounded by the mysterious deaths. While Jacob gave Sam the sheriff a perfectly valid medical reason for the death (a massive collapse of the cardiovascular system brought on by extreme nervous distress), he couldn't tell what brought it on. Penny told Jacob this was out of their league and that he already knew what they had to do. Initally resisting the idea of calling in his nephew because they hadn't spoken in years, Jacob ultimately gave in and sent Penny to New York in order to seek out the Fantastic Four. 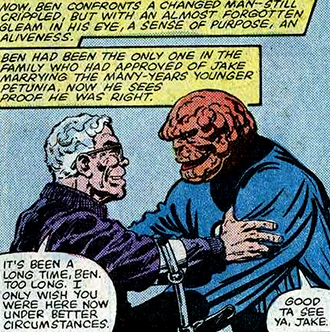 (Fantastic Four I#239) - When Penny arrived with Ben and the other members of the FF, Jacob's bond with his nephew was instantly rekindled. The FF investigated the deaths, with some help from Jacob, Dame Ruth Efford and the small, local girl Wendy. When Wendy's Friends came to Benson that night to test everyone's inner resolve by subjecting them to untold horror, mayhem and fear. Jacob withstood the ordeal. The next morning, he, Penny and 26 other inhabitants decided to remain in Benson while everyone else left. (Fantastic Four I#257 - BTS) - Jacob travelled to New York to personally oversee Franklin Richards' medical treatment at Mercy General Hospital, following the severe injuries the child had sustained at the hands of Annihilus. (Thing I#2) - Jacob and the Invisible Girl were at the hospital, returning from a visit to Franklin's room. 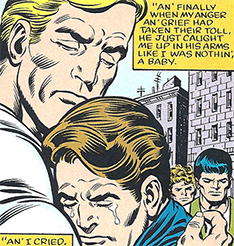 He informed Reed and a newly arrived Ben Grimm that, while the young boy's injuries were severe, he seemed stable. (Fantastic Four I#257 - BTS) - Suspecting she might be pregnant, the Invisible Girl asked Jacob to examine her. Jacob was happy to report Sue was indeed expecting her second child. (Fantastic Four I#257) - After several weeks, Jacob informed Reed, Sue and Ben that Franklin was going to be fine and that the danger had passed. When Ben happily lifted Reed and Sue into the air, Jake urged him to treat the Invisible Girl a little more delicately, considering her condition. (Thing II#8) - Jacob and his wife Penny participated in their nephew's bar mitvzah, celebrating the 13th anniversary of him becoming the Thing. They sent out personal invitations to most of his friends and associates, ranging from Dum Dum Dugan to Willie Lumpkin and Alicia Masters and attended the ceremony as well. Just how anyone expected the town of Benson to survive after over 98 percent of its population moved out was never explained. You'd think a smart man like Jacob Grimm would figure that a medical practice needed more than 26 patients. Curiously enough, it took over 20 years for one of the Fantastic Four's most popular members to get a proper backstory and some actual relatives. John Byrne took the notion of Aunt Petunia, never more than a minor recurring gag, and gave her life as a hot young nurse who had married Ben's elderly uncle Jacob. That lucky guy! Any other "Jacob" or "Grimm"
Jacob's first wife who, along with her husband, became the teenage Ben Grimm's legal guardian after his parents died. By all accounts, she was a kind and understanding woman, patient with her troubled nephew who kept refusing her and Jacob's attempts at showing him love and affection. Eventually, she helped Ben adjust to his new life, cheering him on as he went to college. 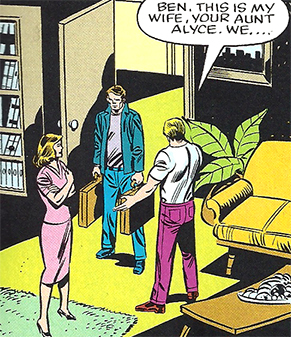 Alyce and Jacob got into a car accident shortly before the Fantastic Four's first spaceflight. Alyce didn't survive the crash, throwing a partially crippled Jacob into a deep depression.